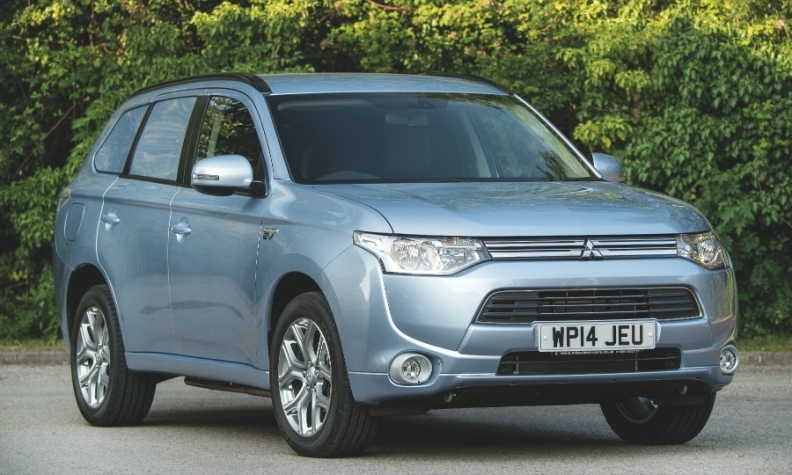 The Mitsubishi Outlander was Europe's best-selling plug-in hybrid last year. Plug-in hybrid cars are forecast to outsell standard hybrids by 2019 and reach 1.2 million sales annually in Europe in 10 years. The rapid rise will come as automakers such as BMW, Volkswagen and Volvo launch more and more models that can travel emissions free at least part of the time so they can meet tougher European CO2 rules that start to take effect in 2020. Overall European growth among conventional hybrids and plug-in hybrids was fairly sluggish last year. Sales rose 8 percent to 232,343, according to JATO Dynamics. Of that, about 40,000 were plug-ins and the rest were standard hybrids such as the gasoline-electric versions of the Toyota Auris, Yaris and Prius. The ratio of plug-ins to conventional hybrids will reverse later in the decade, predicts analyst firm LMC Automotive. “The conventional hybrid market has stalled and the pipeline of new models is weak,” powertrain analyst Al Bedwell told Automotive News Europe. LMC predicts sales of conventional hybrids will reach 325,000 by 2021 at which time plug-in sales are forecast to be 600,000 before rising to 1.2 million by 2024. Volvo, which plans to offer plug-in variants of all its cars, already is seeing strong demand for the technology. The Swedish automaker initially expected to make 5,000 plug-in hybrid versions of its XC90 flagship a year but recently tripled that forecast to 15,000, said Hakan Johansson, project manager for the car. Volvo says output will be increased because of stronger-than-expected global demand, especially from markets such as the Netherlands, France, the U.S. and Canada. The XC90 will be the third Volvo model to offer a plug-in hybrid variant after the V60 and S60L. While Volvo tries to make itself a leading player in the plug-in niche Toyota Motor already has a dominant position in Europe’s market for conventional hybrids. The Japanese automaker’s Toyota and Lexus brands accounted for 72 percent of the region’s sales of conventional hybrids last year. Toyota brand accounted for 58 percent of Europe’s hybrid sales. Leading the way was the hybrid version of the Auris compact with the Yaris subcompact hybrid ranking second. Combined European sales of the two cars topped 110,000. The region’s No. 3-selling conventional hybrid was the Lexus CT 200h premium compact followed by the Lexus IS 300h midsize sedan (see table, below). 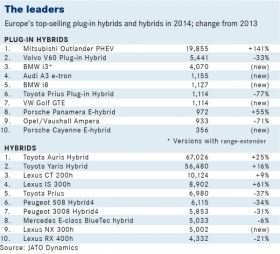 After that, all models in Europe’s top 10 ranking of conventional hybrids had declines in sales last year. Sales of the Toyota Prius fell 37 percent last year, a slump that Bedwell attributes in part to cannibalization by the Auris. According to Ford, which started selling a conventional hybrid version of the new Mondeo this year, sales so far are mainly urban-based buyers as the powertrain is best suited for city travel. Ford has said it expects that just 3 percent of Mondeo sales in Europe will be the hybrid. German premium automakers and Land Rover also have had limited uptake of their conventional hybrids in Europe. Jaguar Land Rover had combined sales of just 266 units of the Range Rover and Range Rover Sport diesel hybrid SUVs. European demand for ActiveHybrid versions of the BMW 7 series, 5 series and 3 series were similarly weak. Bedwell said the problem is that those hybrids don’t offer the consumer a big enough fuel-efficiency advantage to switch. “The hybrid sticker prices are off-putting when stacked against potential fuel savings,” Bedwell said. Plug-in hybrids cost even more, but unlike conventional hybrids, they are a step change for the consumer, Bedwell said. “I believe that electric-only operation will come to be seen as a true luxury characteristic and will be prized sufficiently to command significant premiums,” he said. Porsche has made the switch, replacing conventional hybrid versions of the Panamera sedan and Cayenne large SUV with plug-ins. Last year the Panamera E-Hybrid accounted for 972 sales in Europe compared with 134 sales for its sister model with a conventional hybrid. The Cayenne E-Hybrid, which offers CO2 emissions as low as 79 grams per kilometer, is also on course to outsell the conventional hybrid variant it replaces. Porsche sister brand Audi will offer a plug-in hybrid version of its new Q7 large SUV combined with a diesel engine in Europe while the U.S. and China will get plug-ins mated to a gasoline engine. Currently, the only plug-in diesel sold in Europe is the Volvo V60. During the Q7’s debut at the Geneva auto show last month, Audi head of engineering Ulrich Hackenberg told Automotive News Europe the battery-assisted powertrain “dramatically” reduced CO2 without sacrificing on the power and performance buyers expect in the segment. 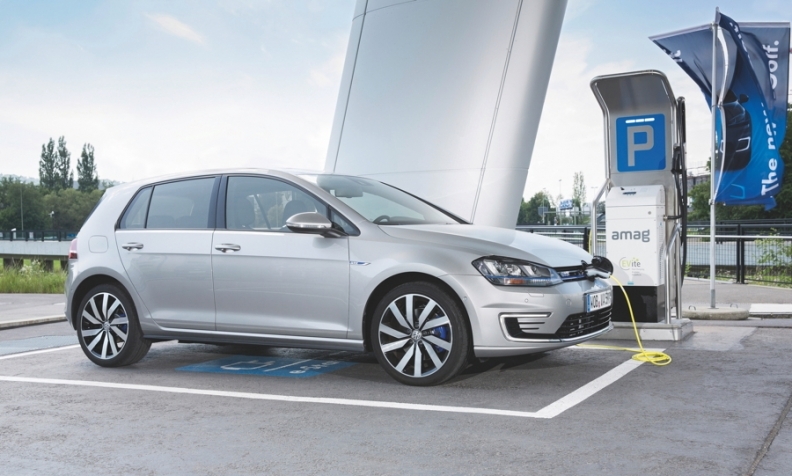 The VW Golf GTE plug-in hybrid is fast but green. It offers 201 hp and CO2 emissions as low at 35g/km. All those SUVs will have some ground to cover to pass the Mitsubishi Outlander, which was Europe’s best-selling plug-in hybrid last year with a volume of 19,855. Sales were concentrated in markets with the best incentives for purchase, headed by the Netherlands and UK, according to the automaker. In the UK the entry Outlander plug-in costs 28,249 pounds (about 39,110 euros) after a 5,000-pound government subsidy is taken into account. The discount makes the plug-in Outlander’s price competitive with its diesel variant in the UK. An additional incentive given to drivers of the midsize SUV is free entry in areas of downtown London that apply a congestion tax based on the amount of emissions a car produces. VW brand doubled its UK sales outlook for the Golf GTE plug-in to 4,000 units because it expects the congestion charge to boost sales.